Top-law-schools.com appreciates Jacqlene Nance, Director of Admissions at the University of Kansas School of Law, for kindly taking the time to answer the following questions. TLS: What does the admissions process consist of, and how is an application rated? The admissions committee, which consists of faculty members and administrators, completes a full file review of each application. The committee reviews the application with the intent to determine if the applicant can succeed at KU Law and if it is a good fit with the applicant in light of the other admitted students. Applicants should pay close attention to their personal statements and attach addendums when necessary. TLS: How do you view applications for Kansas residents? Do Kansas residents receive a boost over out-of-state applicants? As a member of the Kansas Board of Regents, we welcome applications from Kansas residents. All applicants should make sure to include a brief statement discussing their connection to the state of Kansas or interest in KU Law. We do not have a state mandated percentage of in-state students, but we are the only public law school in the state and it is our mission to serve the state of Kansas. TLS: Realistically speaking, how large a part of the admissions process are factors other than a candidate’s GPA and LSAT scores? Of these non-numerical factors, are there any that particularly pique your interest (military service, corporate work experience, Teach for America, etc.)? Can you give examples of what you see as excellent, good, and mediocre non-numerical attributes or accomplishments? The LSAT and GPA are important factors, but they are not what define an applicant. Here at KU Law we look at numerical and non-numerical factors when evaluating an application. We look for individuals with a wide variety of experiences; this helps keep the classroom discussion interesting and fruitful. Non-numerical contributions to the application cannot be ranked; non-numerical factors impress the admissions committee when they are properly showcased in the application. If an applicant has an experience that has helped shape who they are, motivated them to consider law school, or helps set them apart from other applicants, this experience should be included in their personal statement, not buried in the application. Applicants should be proactive in showcasing their life experiences as this is one factor that is strongly considered. TLS: Do you have any advice for students preparing to apply to law school? What about for admitted students to prepare for their first year at the U. of Kansas School of Law? Students preparing to apply to law school should make sure that the law is a profession in which they are genuinely interested! There are many ways to determine this, attending open houses at schools, visiting courts, volunteering in the community, and speaking with practicing lawyers. To prepare for their first year at KU Law, I encourage students to take research- based classes with a written component. Students should also be prepared to work very hard; so if an applicant has excelled in courses, but has not been challenged, they should look for an academically challenging experience. Choosing a law school is a very personal process! Students should first make a list of the factors they are looking for in an educational experience. Factors to consider include: academic programs, bar passage rate, faculty to student ratio, faculty to student interaction, class size, location of the school, alumni community, and student organizations. TLS: How does Kansas view multiple LSAT scores? We accept and report the highest LSAT score. Please note, if an applicant takes the LSAT more than once, the Admissions Committee will review all scores included on their CAS report. Applicants should plan to include an addendum if they took the LSAT more than twice or there are significant differences in scores. TLS: In what circumstances should an applicant include and addendum to explain his or her low GPA or LSAT score? What should this addendum include? An applicant should include an addendum if their UGPA or LSAT score is lower than anticipated. The GPA addendum should be submitted if they had a particularly tough semester and specific circumstances affected their ability to perform. An addendum is also appropriate with changes of their undergraduate major. Applicants should make sure to reference the correct academic year and term. They should also double check that the grades discussed correspond with their CAS report. The LSAT addendum should be submitted if there was a major event close to the LSAT testing time that negatively affected their score. When discussing an LSAT issue, include the testing year and month in the explanation. The best addendums are professional in tone, brief and answer questions the Admissions Committee may have regarding your application. TLS: What percentage of students receives scholarships of any kind and what methodology determines to whom scholarships are awarded? Do Kansas residents have a better chance of receiving financial aid than out of state applicants? Last year approximately 50% of the entering class received some form of scholarship from $3,000 to full tuition and fees. We award our merit scholarships based on a number of factors, including undergraduate GPA, LSAT score, rigor of coursework completed, community activities, work and volunteer experiences, and other life experiences. Applicants who would like to be seriously considered for scholarships should submit their application prior to our February 1st scholarship priority deadline. Additionally, the savvy applicant is looking for outside funding which will go with them to any law school, this lets the student select schools for the curriculum and other opportunities, not just the one offering the best financial package. Kansas residency is required to be considered for the Rice and Weigand Scholarships. Otherwise, Kansans are just as likely as non Kansans to receive a scholarship offer. TLS: Will the current state of the economy affect the distribution of merit scholarships? We hope that the current state of the economy will not affect our scholarship programs. The dean is committed to preserving our scholarship funding and is actively seeking funding for this purpose. TLS: Do applicants, especially those with numbers that fall below Kansas’ medians, increase their chances of admission by applying early? Is there anything that an applicant whose numbers are below your medians can do that would increase their chances of acceptance? We have a rolling application cycle; it is definitely in all applicants’ best interest to apply early; we try to fill our class as early as possible. An applicant with lower numerical factors should weigh whether they want to apply early or retake the LSAT. To know how competitive an LSAT score is, visit www.lsac.org and refer to the Official Guide to ABA Approved Law Schools. This reference contains a lot of information about KU Law, including an LSAT/UPGA profile grid. This grid allows applicants to see how their LSAT and undergraduate GPA compare with our applicant pool from the previous year. They can see how many people applied and were admitted with LSAT and UGPA combinations similar to theirs. If the percentage of applicants to accepted is very low, then the applicant may want to retake the LSAT. Applicants whose numerical factors are below our median should pay very close attention to writing a strong personal statement and attaching addendums, where necessary. The admissions committee will consider the circumstances for low scores as well as an applicant’s interest in Kansas and/or KU Law when making admissions decisions. Additionally, I would encourage applicants with lower scores to make sure to include strong academic letters of recommendation with their application. Personal statements vary by law school. At KU Law, we have a general personal statement prompt. This allows students the opportunity to select which experiences they want to share with the Admissions Committee. Applicants should make sure to include their interest in the state of Kansas or KU Law. This explanation does not have to be extensive; most applicants address their interest in our academic programming or experience in Kansas. It is critical that applicants write personal statements that accurately represent them. They are introducing themselves to the Admissions Committee. Applicants should approach the personal statement as they would a job interview. The personal statement should be clear and concise, paying close attention to grammar, audience and tone. A poorly written personal statement is the equivalent of showing up to a job interview late, wearing dirty clothing and not knowing anything about the position. On the other hand, a well-written personal statement is the exact opposite. The admissions committee views the personal statement as an opportunity to understand the applicant’s interest in and motivations to attend law school; this opportunity should not be squandered. I want to emphasize that an applicant does not have to find “the perfect quotation” or conjure up a sob story, an applicant should first explore why they are interested in entering the legal profession. The best personal statements show the applicant’s genuine interest in law school with well articulated reasoning. If there was an experience that has motivated a student to consider law school, this is the place to convey that experience! The Admissions Committee is interested in learning about the student, so if the motivating experience was painful they may share that with us, but if it was an academic experience or volunteer experience, that experience is persuasive as well. TLS: Could an applicant significantly improve his or her chances of admission by drafting a personal statement specifically for Kansas, as opposed to a general personal statement that briefly mentions Kansas, if at all? The best personal statements are focused on the applicant’s motivations and experience, but include a paragraph about the applicant’s interest in KU Law. We ask our applicants to submit a personal statement about their experiences and how they feel KU Law will help them achieve their goals. We do not expect the personal statement to be more about KU than about the applicant-we want students to use this space to shine! TLS: Do you come across personal statements that actually hurt the applicant’s chances? If so, what are some traits of these statements? Are there any clichés or pitfalls an applicant should avoid? How often do you find statements that really stick out from the crowd and what do these statements consist of? I come across personal statements that hurt applicant’s chances for admission on a regular basis. Similar traits of these statements are grammatical errors, unorganized or unclear writing, the use of a non-professional tone, and overly long (we once received one that was 7 pages long!). There are a couple of mistakes that stand out more. The first mistake is submitting a personal statement that discusses the applicant’s interest in another law school. Applicants should pay close attention to each application they plan to submit to avoid this mistake. The second major mistake is writing a personal statement that is so general that the Admissions Committee questions the applicant’s interest in law school. If the personal statement could be submitted with a graduate program application as well as with a law school application, this statement will not be persuasive to the Admissions Committee. Applicants should use their best judgment when seeking letters of recommendation. If the student is a recent graduate they should plan to have two academic letters of recommendation. If the applicant has a work or volunteer supervisor with whom they worked closely, than they may add a third letter of recommendation. The first rule of thumb is to have the recommender be someone who has directly evaluated your work product, either academically or in a work/volunteer situation. An individual who is impressive, but has not assigned tasks to be completed and then determined how well the task was completed is not as persuasive as a former professor or work supervisor. TLS: Does the admissions committee come across letters of recommendation that actually hurt an applicant’s chances of admission? If so, what sort of letter should be avoided? How often do you find letters that really stick out from the crowd and what do these letters consist of? Yes, there are letters of recommendation that can hurt an applicant’s chances of admission. Applicants should avoid asking family members or family friends for letters of recommendation. While these individuals may write truthful letters of recommendation, it is evident that their perspective is biased; a letter of recommendation from a personal or familial acquaintance is not as effective as a letter of recommendation from an unbiased party. Each year we come across letters of recommendation that discuss how unsuited or unprepared the applicant is for law school. While the committee finds these letters helpful in our decision making process, the applicant shows poor judgment in seeking a letter of recommendation from this source. Applicants should plan to meet, in person, with the person they are asking for a letter of recommendation and have a conversation about their goals and aspirations. The applicant should then ask the person if they feel they can write a good letter of recommendation for them. Do not seek out individuals for whom your past performance (academic, ethical or professional) has been substandard. Additionally, we often come across letters of recommendation written by someone who does not know the applicant’s work product well enough to assess them. The Admissions Committee values the letters of recommendation as an accurate assessment of the applicant’s abilities. Applicants should seek letters of recommendation from individuals who personally know them and can speak to their abilities. It is always clear when the recommender knows the applicant well; the recommendation letter is more enthusiastic and persuasive. TLS: How much will an upward grade trend positively influence the likelihood of admission? An upward grade trend is viewed positively by the Admissions Committee. We complete transcript evaluations for each applicant; this evaluation looks at the applicant’s entire undergraduate and graduate academic performance each semester. An applicant should include an addendum if there was a time when they did not perform well. The admissions committee does take these circumstances into consideration. TLS: Do you consider the relative prestige or rank of an applicant’s undergraduate institution? What about the relative difficulty of an applicant’s undergraduate major? The Admissions Committee does a transcript evaluation of each application. We focus more on the rigor of student’s undergraduate career rather than the “prestige” of the institution. We focus more on the difficulty of the applicant’s course work than the major. It is imperative that applicants make sure to take challenging classes; especially courses that require research and writing. 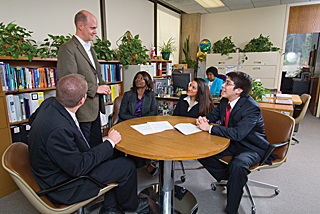 If an applicant is concerned that the Admissions Committee will not be as impressed with their undergraduate institution or major, they should plan to get a letter of recommendation from a professor in their major to discuss the rigor of the program, as well as how the student performed. TLS: How do you view graduate degrees and do you take graduate GPA into consideration? Every aspect of the applicant’s post secondary educational experiences are taken into consideration. If an applicant has completed a graduate degree, the admissions committee will consider this experience, along with the undergraduate degree and other factors in the application. A student’s success in graduate school will be viewed favorably, though the graduate degree grades will not be calculated into the undergraduate GPA. If a student performed much better in graduate school than in undergrad, I generally encourage them to add an addendum highlighting this fact, explaining the difference. I also encourage students to ask one of their professors from the graduate program to write a letter of recommendation for them. TLS: What is the typical size of the Kansas waitlist, and how deep do you usually go into the waitlist to admit students? We do not release the size of our waitlist, since it is unranked. We use the waitlist to keep the balance in the class; as admitted students withdraw, we try to “replace” the student with another of similar characteristics. We allow students to determine how long they would like to stay on the waitlist, and we try to keep them notified of major movement on the list. How many students are admitted off the waitlist is completely dependant on how many students decline our offer of admission. TLS: Once on the waitlist are there any steps one can take to increase their chances of getting off the waitlist? All waitlisted students are sent a letter and Frequently Asked Questions (FAQs) sheet. Students interested in increasing their chances of getting off the waitlist should carefully follow the instructions provided with the waitlist form. Specifically, they should (at the minimum) return the waitlist form and provide a short statement explaining their interest in KU Law. To really stand out, the students may provide all of the suggested materials as detailed in the letter and FAQs. TLS: How many transfer applications does Kansas School of Law typically receive, and what percentage are offered admission? What are the main factors taken into consideration in reviewing a transfer application? We receive approximately 10-20 transfer applications per year. About 90% of them are offered admission. The main factors that are taken into consideration when reviewing a transfer application is the applicant’s academic history (both in undergrad and in law school) and the student’s interest in KU Law and/or Kansas. TLS: Whether it’s for good or for bad, a lot of applicants take a close look into the US News and World Report Law School Rankings and possibly even factor those rankings into their decision making process. Does this pressure the admissions office into being maybe more numbers driven than they would like to be? Here at KU Law we make admissions decisions based upon the standards set forth by the Admissions Committee; our focus is on having a class of diverse, interesting and accomplished students. We are more concerned with admitting a class that will enrich our academic climate than to increase our rank. TLS: What do you feel students enjoy most about the University of Kansas School of Law? I feel that KU Law students enjoy the variety and accessibility of our clinical programs. Here at KU Law, we provide students with a number of practical experiences to prepare them for the practice of law. I also think that students enjoy the relatively small community; while we are part of a large university, the law school is pretty small. We have about 500 students total, all of our classes are held in one building, and Lawrence, KS is a great place to live and study! TLS: What is the chief critique that current students would have about the law school and what is being done to address this concern? Our students have very few complaints about the law school. I feel that our students are content because most thoroughly researched the school before enrolling, so they know what to expect. I also feel that the law school administration and faculty does a good job of listening to student concerns and taking action to address it. One common concern is the parking situation. While we are fortunate to be in a less crowded place on campus, we do have to deal with some parking inconvenience which, unfortunately, is part of being in a large university. Our students are adept at timing their arrival time to avoid any hassles! TLS: A lot of applicants who get admitted into Kansas will also be admitted into other very good Midwestern schools such as Missouri and Oklahoma. How is Kansas School of Law distinguished from these other schools? The Midwest is very fortunate to have a number of well respected law schools. I can only speak about what I am impressed with at KU Law, not complete a comparison with other schools. We have great programming at an affordable price in a collegial environment. KU Law has a number of clinical programs, certificate programs, with a low student to faculty ratio. 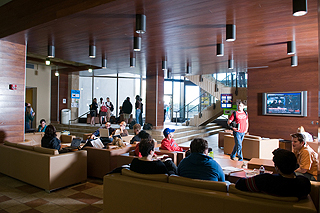 Our physical building is arranged to encourage faculty and student interaction- the faculty offices are easily accessible in the stacks of the library. The faculty is enthusiastic about interacting with students, both in and out of the classroom, and ensures that they are accessible. TLS: Do students have a more difficult time finding employment, considering the school is such a distance from the major legal markets like New York City or Washington D.C.? How closely does Kansas Law School work with the bigger firms in the state, especially in the Wichita and Kansas City areas? Our Office of Career Services works closely with each of our students to help them reach their career goals. Though a number of students plan to stay in the Midwest, we have a number of students who seek employment in different legal markets. Each year we have students who intend to practice outside of the Midwest and our career services staff effectively helps them with that search. 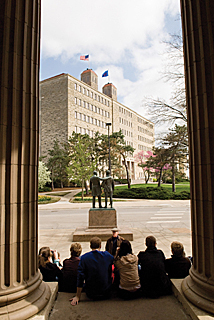 The KU Law degree has a strong reputation, both locally and nationally, and a very strong alumni base. 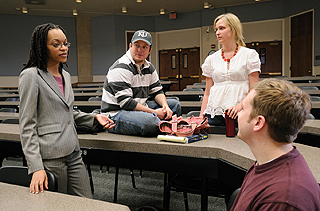 KU Law helps students find all types of legal employment, including placement in big firms. We have an active On Campus Interview program, as well as close ties with the legal markets in Wichita and Kansas City. TLS: What type of debt and employment situation is the typical Kansas law student going to be in after graduating near the median of his or her class? 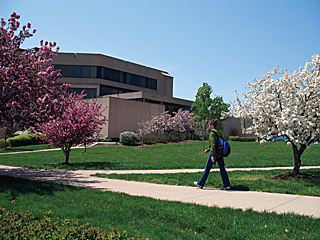 KU Law’s tuition and fees are competitive both locally and nationally. We pride ourselves on keeping tuition low so that our students are able to graduate with minimal debt, allowing them to work any field they chose. We have a good placement rate for the entire class, traditionally in the upper 90th percentile nine months after graduation. The debt load varies greatly, though the average debt load is around $65,000. TLS: More than 40% of Kansas Law graduates stay to practice in the state of Kansas, according to your website. Is this due to the students’ preference of Kansas or because the students are having a tough time finding work outside of the state? The KU Law degree travels very well. A large percentage of our graduates remain in Kansas because they truly love practicing here. Each year our entering class is approximately 65-70% Kansans, so it is not a surprise that many of them want to stay here to practice. Not only do our Kansans remain, but a number of our out-of-state students remain in Kansas because they fall in love with this part of the Midwest. TLS: Do you have any additional, general advice that you would like to offer applicants who are reading this interview before putting together applications for the University of Kansas School of Law? I would encourage applicant to keep 3 things in mind. 1. Make sure that your personal statement includes a brief description of your connection to, or interest in, Kansas or KU Law. 2. Timing is important; please submit your application as early as possible. 3. In order for the Admissions Committee to view an applicant by more than their numerical factors, the applicant must provide more personal information; pay close attention to the personal statement, resume, addendums and letters of recommendation.